“On the face of it, it appears to be a disparity,” said Seattle Police Assistant Chief Perry Tarrant. Overall, jaywalking tickets are way down in Seattle, but a disproportionate percentage are issued to black people. A jaywalking ticket in Seattle will set you back $68. But if the countless pedestrians who cross against the light every day don’t seem overly concerned, they have good reason. Seattle police are writing a lot fewer jaywalking tickets lately — last year, the total was just 160, according to Seattle Municipal Court records. The numbers have dropped steadily since 2010, when police issued 461 citations. 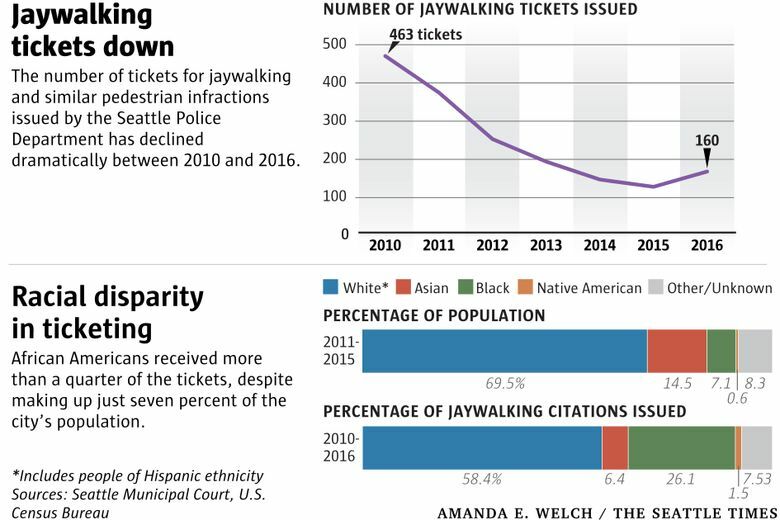 Even with the decline, however, one pattern persists: A disproportionately high percentage of jaywalking tickets in Seattle are written to black people. Of the total 1,710 jaywalking tickets issued by Seattle police from 2010 to 2016, 447 — more than one in four — went to a black pedestrian. In any given year during this period, the share of tickets received by black people never dipped below 20 percent. In 2016, 28 percent of the citations were written to black people, who represent just about 7 percent of the city’s population, according to census data. Tarrant notes that the way the police department collects data on race has serious limitations. Officers determine the race of an individual based on appearance, and can only pick one of five categories: Asian, black, Native American, white and unknown. The department does not track Hispanic ethnicity. “We have a very diverse population, and we squeeze them all into five categories that may not necessarily be appropriate,” Tarrant said. Even so, he said he does not believe that officers are over-categorizing people as black when issuing jaywalking tickets. Rebecca Boatright, chief legal officer for SPD, cautioned against drawing conclusions regarding bias from the data because of the small number of citations, the lack of circumstantial information and the pitfalls of comparing Seattle’s population to those who were ticketed. “I’d be very surprised if any meaningful inference could be drawn here,” she said in an email sent after the original publication of this column. Boatright also noted that there are over 500 pedestrian-involved collisions in Seattle annually, and enforcement – along with education and engineering – play a critical part in prevention. The court data shows that white people received 58 percent of jaywalking tickets from 2010 to 2016. However, that number is likely inflated because officers are instructed to include Latinos in the “white” category, according to Sean Whitcomb, public affairs director for the SPD. Asians, who make up about 15 percent of Seattle’s population, only received 6 percent of jaywalking tickets. The data show that men are ticketed for jaywalking 2 ½ times more than women. The most ticketed age group is 25 to 34, receiving more than one-quarter of all citations. I wasn’t able to map out where in Seattle the tickets were issued because only a handful of the electronic records include location information. The court records show SPD officer Michael Chin has written the most tickets for jaywalking since 2010 — a total of 169. Of those, 31 percent were issued to black pedestrians. But Chin only wrote three jaywalking tickets in 2015, and none in 2016. The sharp decline in the number of jaywalking tickets issued by SPD officers is not the result of any change in police practices, according to Tarrant, but rather the result of a traffic enforcement division that is stretched too thin in a fast-growing city. The department’s staff numbers, though, have remained static. “We have to prioritize where we’re assigning resources,” Tarrant said. Police departments across the country have come under scrutiny for disproportionately stopping black people for low-level infractions like jaywalking, particularly since the 2014 incident in Ferguson, Missouri, in which Michael Brown, who was black, was shot dead by a police officer. Brown, 18, was initially stopped for walking in the middle of the street. An investigation published in April in The Sacramento Bee showed how law enforcement there heavily ticketed for pedestrian infractions in majority black neighborhoods. And last month, a jaywalking incident became national news when a white police officer in Florida was videotaped threatening to jail a black man for the infraction. The officer also fined the man for not carrying an ID, even though Florida law does not require it of pedestrians. In 2010, Seattle had its own viral video of an incident that started with a group of black teenage girls being stopped for jaywalking by Officer Ian Walsh. The situation escalated, and Walsh was videotaped punching one of the girls. Walsh was cleared by the department of using excessive force. But a 2011 U.S. Department of Justice report, that preceded a 2012 consent decree, listed jaywalking among the minor offenses that led SPD officers to “repeated uses of excessive force.” In April, the federal monitor overseeing police reforms in Seattle found the department to be in initial compliance regarding use of force. 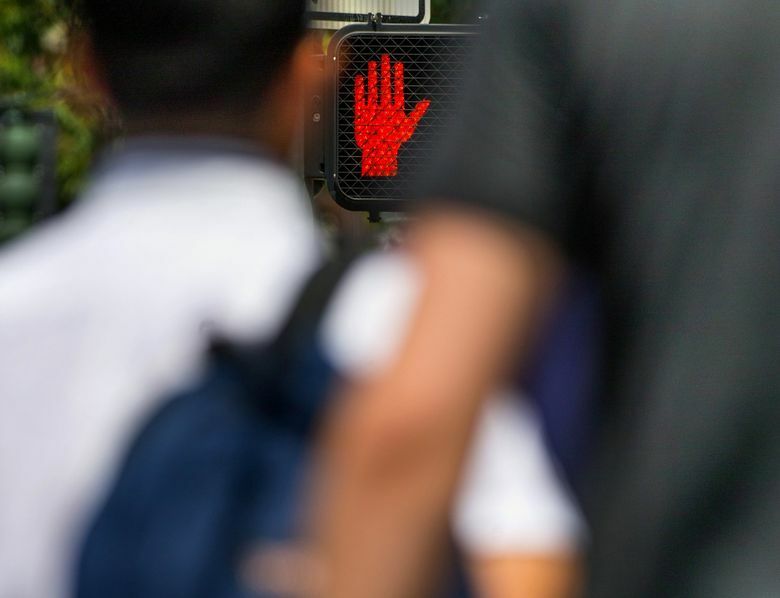 Kathleen Taylor, executive director of the ACLU of Washington, said in a statement that she applauds the decline in jaywalking tickets issued by SPD, adding that police have more important work to do. Editor’s note: A comment from SPD chief legal officer Rebecca Boatright was added to this column at 3:45 p.m. on July 21, 2017.